New research from Yale University shows that nearly one in five high school e-cigarette users also have used the device to vaporize cannabis or byproducts like hash oil. E-cigarettes not only vaporize nicotine, but they work with marijuana as well, American teenagers are discovering. Yale University researchers surveyed 3,847 Connecticut high school students by Yale University researchers and found nearly one in five e-cigarette users also have used the device to vaporize cannabis or byproducts like hash oil, according to a study published September 7 in the journal Pediatrics. “This is a relatively novel way of using marijuana, and kids are using it at a fairly high rate,” said lead author Meghan E. Morean, now assistant professor of psychology at Oberlin College, who conducted the research while in the lab of senior author Suchitra Krishnan-Sarin, professor of psychiatry at Yale. E-cigarette use among teenagers has been increasing nationally, and 27.9% of high school students reported using e-cigarettes in the current study. Of those users, 18.7% say they have used e-cigarettes to vaporize marijuana. E-cigarettes are powered by batteries that activate a heating element when inhaled, vaporizing a liquid nicotine solution contained in small tubes. 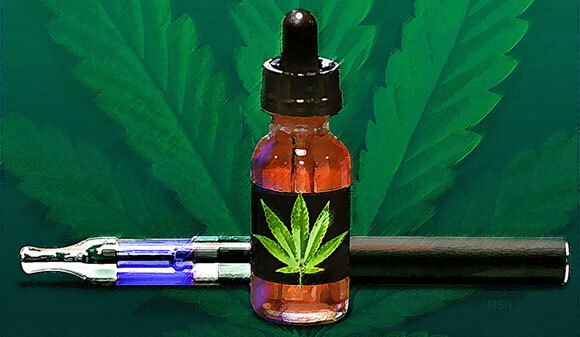 Hash oil can be substituted for the nicotine solution in many traditional e-cigarettes, and some vendors sell e-cigarettes specifically designed for use with marijuana leaves or wax infused with THC, the active ingredient in marijuana. “The smell of vaping marijuana isn’t as strong as smoking it, plus the similarity in appearance of hash oil and nicotine solutions make this a really inconspicuous way of using marijuana,” Morean said. Both Morean and Krishnan-Sarin stress the survey does not assess whether the availability of e-cigarettes leads to more marijuana use in youth. However, they note that vaping concentrated liquid forms marijuana can be much more potent than smoking dried marijuana leaves. Other Yale authors are Grace Kong, Deepa R. Camenga, and Dana A. Cavallo. The study was supported by funds to Dr. Krishnan-Sarin through grant P50DA009241. Morean, Kong, and Camenga’s efforts were also partially supported by NIAAA grant 5T32AA015496, NIDA grant 1K12DA033012, and Clinical and Translational Science Award grants UL1TR000142 and KL2TR000140. The sponsors had no role in the study design, collection, analysis, or interpretation of the data, writing of the manuscript, or the decision to submit the manuscript for publication. Be the first to comment on "One In Five High School E-Cigarette Users Vaporize Cannabis"